Dawn in the Amazon rainforest, and even through the early morning mist the scars of deforestation can be seen. In the Amazonian state of Para, years of destruction have left their mark, with land cleared by loggers or for use by cattle. Travel in this area can be precarious, as you drive along flooded dirt tracks and cross fragile bridges just narrow enough for one vehicle to pass. Twisted metal hangs from the front of a bus that amazingly makes its way along this route, creeping tentatively up the muddier slopes, and travelling more slowly going down them. We are making a five-hour journey from the town of Paragominas, to the small community of Tembe Indians. 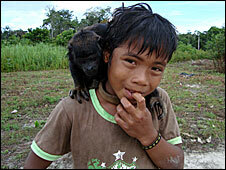 This report is part of a BBC World Service special on the Amazon rainforest. Starting at 0500 GMT on Thursday 15 May, there are live and recorded broadcasts. Highlights include a double edition of Newshour, presented live from three locations in Brazil - Manaus, Paragominas and Alta Floresta - at 1200 and a one hour special at 1600. This tribe now has the support of government agencies and some of the wooden houses with thatched roofs have satellite dishes, but this was an isolated group of people when they were discovered by Catholic missionaries in the 17th Century. Local community leader Valdeci Tembe tries to preserve some of the rituals here, singing in his native Tupi Guarani language, and handing down traditions to his children as was done from generation to generation. 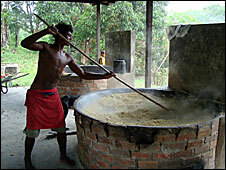 These are some of Brazil's poorest people, and for the families who live here along the river life follows a simple routine. In the hot sticky rainforest the cooling waters are a welcome relief for the local children, while for one boy a monkey from the nearby rainforest is a favourite family pet. Government agencies do provide backup and medical assistance, but the community here says the government has no coherent plan for the future. On indigenous land in the nearby rainforest there are also signs of illegal logging, which local people say the authorities have allowed to happen here for at least 20 years. The Tembe Indians say around 40% of their land has been cleared, but the government ignored pleas to do anything about it. They say that as the authorities failed to act, some of their community also became involved in selling wood illegally, but for now this has stopped. Among Indians traditionally associated with protecting the rainforest, it seems some began to ask why if others are making profits from the wood, should it not be open to them as well. "In truth this community is tired of waiting for some response from the government not only to protect the forest, but to give the native Indians better conditions of living, says Valdeci. "This has never happened and has led to the Indian community getting caught up in the selling of wood." It is this general impunity surrounding logging which Valdeci says prompted some indigenous people to get involved in the past, he says. "In fact cutting wood is not a problem for anyone. In reality people cut wood where this is an Indian reserve or where there this not - even when it is illegal they cut," says Valdeci. "What motivates this is the impunity." 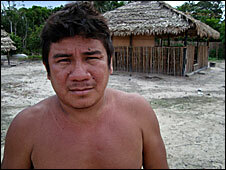 The plight of indigenous people in this area is recognised by the Brazilian authorities. "A combination of a clampdown by the police and the state to the prevent the illegal removal of wood is fundamental," says Juscelino De Carmo Bessa, of Funai, the government agency which looks after the interests of indigenous people. Surely better control and management of the current resources would be a better plan, or do they seem to forget that an enormous percentage of all the oxygen worldwide originates from the Amazon area? "But it has to be combined with economic alternatives for them to buy the products they need from the market but which they don't have." But for the Tembe Indians sympathy is no longer enough - they say they want options that will guarantee an economic future for them and their children, such as sustainable logging in the nearby forest. As night falls on another day in Amazon these are troubling times for the region's oldest residents, who say they are still waiting for the full extent of their problems to be recognised. Can the Amazon be developed without being destroyed?